This Sunday we will celebrate our traditional annual Water Communion ceremony with our new Interim Minister Rev. Jo Green. Remember to bring a vial of water that you have collected over the summer to represent our connection to each other from the places in our lives. Rev. Jo Green will discuss our connection to each other through covenant and how we respect and connect with each other through the Unitarian Universalist faith of shared covenant. Rev. Green will lead the service and assisting will be Worship Associate Jen King. Jay Steele will provide our music. Sunday, Sept 9. Tickets are $25 each. 9:00 a.m. – 12:00 p.m. We’ll meet at the Don Edwards Wildlife Refuge in Fremont at the fishing pier at the end of Marshlands Road. Bring a hat, sturdy shoes, water, sunscreen, and gloves and a refillable water bottle if you have them. Removing invasive non-native plants may be an option on this day. Children under 18 may participate with parental approval. Volunteer Agreement form and bring it to the event. Look for your Mission Peak Team! to participate in programs that actively involve students in investigating the diverse habitats and wildlife of the refuge. Hands-on, small group activities teach basic ecological concepts and introduce endangered species, migratory birds, and wetland habitats. Donate cash or checks made out to Mission Peak UU Congregation and we will write a check for the Bus Fund. If you can’t be at the service you can send your own contribution and note that you are donating as part of our congregation. The Sandwich Squad is looking for volunteers to help make sandwiches on September 16 and the third Sunday every month! The Squad starts after grabbing a cup of coffee after the service and meets in the kitchen. All supplies are provided. They usually finish by noon or a little later. The sandwiches are dropped off during the week at TriCities Volunteers for distribution to the needy in our community. Speak to Don Ramie for further information. – Residents Insisting on Social Equity is a coalition of church, unions, tenants, and others, fighting for stronger renter protections in South Alameda County. We’d like someone to attend their meetings, inform us about what we can do to help, and participate in their activities. This is a great group of young and old working together to make change happen! Contact Allysson McDonald for more information or to sign up! – Abode Services partners with local congregations to help clients with move in costs, furnishings, housewares, and welcome baskets. We need a representative to attend monthly meetings, coordinate our assistance, and share information. It would be great if you have a truck and possible storage space. If you can help, please contact Allysson McDonald. We cannot partner with this program without a coordinator. – Interested in helping register teens and young adults to vote in the upcoming election? Kathi Bayne has been working with a group that does this! They can use volunteers at school sites and other locations as well as folks who can help at home by highlighting forms, etc. Please reach out to Kathi (our newest member! Yay!) to let her know you are interested. 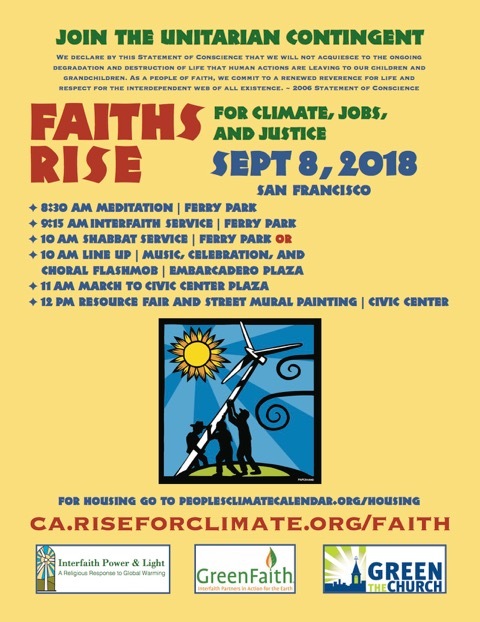 Rise for Climate, Jobs & Justice! UUMFE is joining tens of thousands of people from across the country on the streets of San Francisco to Rise for Climate, Jobs, & Justice days before Governor Jerry Brown’s Global Climate Action Summit to show our elected leaders that we demand action on climate change. 11:00 am and go from Embarcadero Plaza to Civic Center Plaza. Wear your Standing on the Side of Love shirt or some other UU clothing, and bring water, snacks and sunscreen. 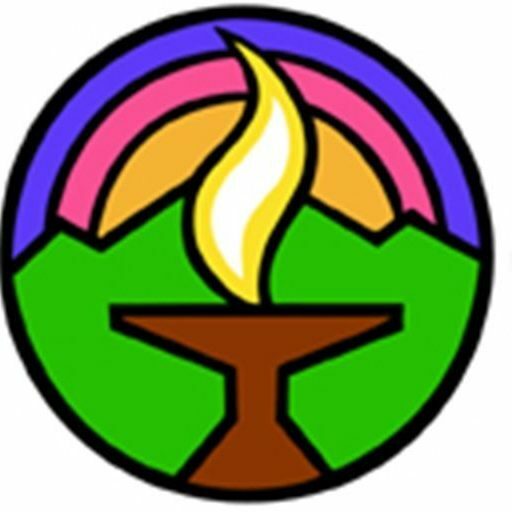 A new choir for ALL people is opening in Fremont. Mission Peak Chamber Singers breaks ground in a new, unique musical initiative that opens the doors of a choir experience to everyone. A non-auditioned, fee-free, open ensemble, where people of all ages and all backgrounds can learn to sing together. Bridging the God Gap: Finding Common Ground Among Believers, Atheists and Agnostics; Your Living Mind: The Mystery of Consciousness and Why It Matters to You; Do Think Twice: Provocative Reflections on Age-Old Questions; and Feel Better Now: 30 Ways to Handle Frustration in 3 Minutes or Less. 20% of the proceeds will be donated to MPUUC.